Waist to hip ratio is a simple measure of where fat is stored in your body. Most people store their body fat in two places: around their waist and around their hips. Storing extra weight around your waist (apple shaped) puts a person at a higher health risk than someone carrying extra weight around their hips and thighs (pear shaped). Use a measuring tape to take your waist and hip measurement. This kind of measuring tape is often found in sewing kits. If you do not have a measuring tape available, use a long piece of string or yarn instead and then measure the length of the string using a regular ruler or yard stick. Stand in a relaxed position breathing normally when you take the measurement. Do not pull tightly on the measuring tape or string so it's cutting into your skin. Waist: Your waist measurement should be taken at the smaller section of your natural waist, usually located just above the belly button. 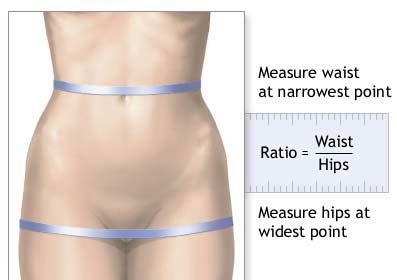 Hips: Your hip measurement should be taken at the your hips on the widest part of your buttocks.